Looking to climb your first 4000m peak? Climb some amazing rock ridges and spires? Summit Mont Blanc with your friends? Conquer your first north face? I will be happy to turn your dream into a reality. Feeling good after ascending the Hornli Ridge, Matterhorn. Why not climb some of these beauties? There’s something for everybody, so we could rapidly tick off your first 4000’er. Maybe you’d like to try one of the harder ones - like the Matterhorn? The classics are obvious targets - Mont Blanc, Weissmies, Gran Paradiso - but don’t forget the many lesser known Alpine peaks. 3000m peaks pack a punch too! All of these peaks require at least one night in a hut in order to acclimatize. During the build up to the ‘main event’, we will sharpen your technical skills to make the ascent as straightforward as possible. Acclimatizing is very important and is done on various peaks up to 4000m. The Alps are home to a multitude of outstanding rock faces, great granite cracks and majestic spires. Some are only one pitch high, while others involve 20+ pitches of dreamy climbing. Rock climbing in the Alps can be done at all altitudes, from road side crags through to stepping off a glacier to get to your first belay. So, whatever your level and aspirations, there are many routes that will suit you. 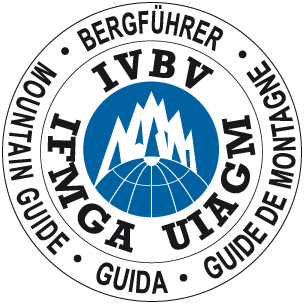 All my Alpine courses are bespoke - unique to you and your group - so we can develop an itinerary that suits you perfectly. If you wish to sharpen your skills, learn to travel safely on glaciers, climb multi-pitch rock routes or lead yourself up your first 4000m peak, then our time together may lean more towards the instructional side. Here maybe less distance and height will be covered but the technical input will be much higher! If you are aiming to bag specific peaks and routes, then these will be our focus. A useful element of instruction ‘on the go’ will also be included. You will never be ‘tied in and dragged up’ but you will be offered a host of new skills to make your ascent more enjoyable. Working together as a team is very important and your chances of success are far greater when everyone does their bit. So, if you have a dream to climb a specific route, please get in touch. If you’re keen to experience mountaineering in the Alps, please get in touch. I will offer you a mountain itinerary that you will remember for a lifetime.